Meade is a self-described “specialist in research and investigations.” Apparently, his doomsday claim has some people nervously eyeing tomorrow, September 23, 2017, as the beginning of catastrophic events that will begin to befall Earth. His claims have been reported in Newsweek, Fox News, the Huffington Post and several other media outlets. Really? You can’t make this stuff up. Furthermore, Meade believes global catastrophes will be caused by a secret planet called Nibiru passing the Earth on Saturday. 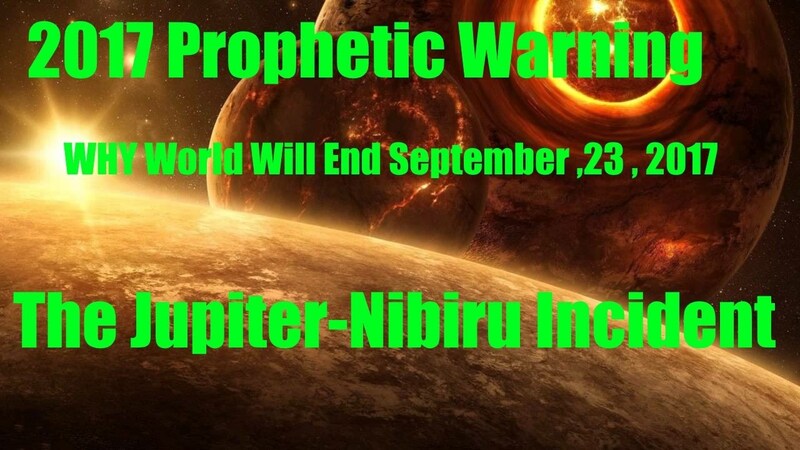 NASA has repeatedly debunked stories about Nibiru as a wayward planet. They “are an Internet hoax,” the space agency said. “There is no factual basis for these claims. Religious leaders from various groups are “calling out Meade and others over the latest doomsday predictions.” “Meade’s views are not endorsed by Roman Catholic, Protestant or Eastern Orthodox branches of Christianity,” Fox News reported. “Meade is a made-up leader in a made-up field, and should not be on the front page of anything, let alone Fox News,” Ed Stetzer of Christianity Today wrote. This latest end of the world prediction is based upon a false doctrine and faulty Biblical exegesis. There are many different theories about “the rapture” propagated by various cults. They are all based on an incorrect understanding of the book of Revelation and the Old Testament prophets. End of the world predictions are nothing new. Three theologians said the world would end in 500 A.D. Various clerics predicated Christ’s coming at the end of the first Millennium, January 1, 1000. Past predictions have targeted the years 1260, 1370, and 1700. Charles Taze Russell, the first President of the Watchtower Society of Jehovah’s Witnesses, said Christ would come in 1874. The “Witnesses” have made several other failed predictions through the years. In more modern times the end of the world has been predicted by religious leaders Herbert W. Armstrong, Jerry Faldwell, Harold Camping and Jack Van Impe. In fact, there have been well over 200 documented predictions regarding the end of the world. Obviously, all such prophecies have not come to pass. The apostle Peter affirms by inspiration that the “Day of the Lord” will come “as a thief in the night.” (2 Pet. 3:9-10). When the apostles asked Jesus what would be the signs of the His coming He responded this way. “Watch, therefore, for you do not know what hour your Lord is coming.” Then he used the thief analogy to illustrate His point. Indeed Christ is coming again. But nowhere does the Bible teach we will be raptured for 7 years, then return to reign with Christ on earth. Here’s what the Bible says. “For the Lord himself will come down from heaven, with a loud command, with the voice of the archangel and with the trumpet call of God, and the dead in Christ will rise first. After that, we who are still alive and are left will be caught up together with them in the clouds to meet the Lord in the air. And so we will be with the Lord forever” (1 Thess. 4:16-17). John’s warning is appropriate when considering Meade’s predictions and others of his ilk. “Beloved, do not believe every spirit, but test the spirits to see whether they are from God, for many false prophets have gone out into the world” (1 Jn. 4:1). Whether Meade is right or wrong is not my concern. Whatever he used to bring his facts of rapture to conclusion is solely his own opinion. The truth remains that the rapture is about to take place. “Capture the rapture” was my first post on my blog. God revealed it to me. Read my first blog. Can’t you see how people are reacting to Meade’s findings. It simply means many are not prepared. It doesn’t sound scary to me. It makes me more prepared. I don’t know which is the sadder: people who make these predictions basing their claims on something they think they find in the Bible which clearly says that no one knows except the Father, or the people who publicize them. david meade, wants a name for himself, wants to be known/notice, and money, he’s very deceit ful, betrayal, him and his foolishness. And, no such thing as a rapture. Again, tbere will be no rapture, the Bible, very poor translations and lits of holes in it.